The Cheraw Fish Hatchery was constructed in 1937 with Federal Funds and assigned to the state for operation and maintenance. However, the facility was returned to the Federal Government in fiscal year 1947/48. and was renamed Cheraw National Fish Hatchery. Ownership of the hatchery was returned to the state in 1983 as part of the U.S. Fish and Wildlife Service’s effort to reduce warmwater hatchery operations throughout the Federal system. 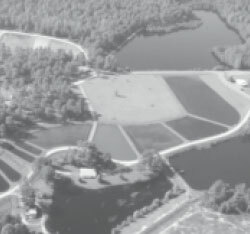 The Cheraw Fish Hatchery is located five miles SSW of the City of Cheraw adjacent to U.S. Highway 1. The Cheraw brochure is provided in the Adobe PDF file format. Adobe® Reader® is required to open the above files and is available as a free download from the Adobe® Web site. Number of Ponds: (31) production ponds and one (1) reservoir pond. Over two million fish are produced annually at the hatchery. Water Source: Reservoir pond (Little Puddin Lake), watershed runoff and supplemental pump from Juniper Creek. Acres of Water: 30.5 acres production/ reservoir ponds.